The film won the award for Notable Entry in the General Category at the Tokyo International Anime Fair in 2005. In Korea, it received a Best Film Nomination at the Seoul Comics and Animation Festival. It then went on to win Best Short film at the Fantasia Festival in Montreal. Kakurenbo is a one-shot ova and is Yamatoworks first attempt at an anime. And as the title suggests, its an OVA about hide and seek. But like any good anime out there theres a lot of rules and twists to this 30 minute show. Thirty minutes isn't enough time to flesh out character backgrounds and a deep story but it gives out the rules and punishments of the game all in the beginning of the show. And that gives this show a lot of points from me considering how confusing and crazy the show gets right away. For example one of the rules gets broken even before the game begins. But it all will start to make sense toward the end. As for the characters, they're all grade school children but they all have their own unique style and look. For instance, one kid has earrings big enough to have a kanji symbol on it, another has a mowhawk, etc. Regardless these kids arent your typical type of kids but I don't think this show is aimed toward a young audience considering the graphic nature of this OVA. Well its not a graphic violence but more of a psycho thriller. Which is pretty unique since you dont see these types of anime being produced as much. But back to the characters, they all wear fox masks as a requirement to play the game. I'm assuming this is a move to save money on animation, or it can be to increase the scare factor of the show. Which brings me to the art and animation of the show. Apparently it took the production team 6 months to produce this one episode, and you can see that most of their work was put into the art and animation of this show. It looks like most of the show was hand drawn but the characters are a mix of cell-shading and hand drawn animation. As you well know this combination usually looks pretty bad, but surprisingly they managed to make it look really REALLy good in this show. The antagonists are all vibrant and oozing evil, neon lights all have a soft neon glow, posters on abandoned walls are written out with care, and even heaps of trash and debris have their own beauty to them. The detail to the background artwork is just insane it appears they put in just as much work to the backgrounds as they did to the characters. As for the sound effects and voice acting, one turns out VERY EXCELLENT and the other turns out VERY mediocre. The sound effects are top notch and set the mood all perfectly. Almost a little too perfect. Still air can be heard, buzzing of neon lights, even the dilapidated buildings that make the setting all creak and crack with antique clarity. At times, the sound will actually make you jump if you get too into the show. On the other hand, the voice acting is mediocre at best. Most of the time they don't even speak, they mostly run and scream in fear. Two of the kids don't even speak at all. But where there is no dialog, they're usually some sort of suspenseful, creepy, or downright ominous song brooding over the show. Anime: Kakurenbo is a half-hour OVA that was produced as a collaboration between CoMix Wave Inc (known for their work on 5 Centimeters per Second and Voices From a Distant Star), Dentsu Inc (known for their work on Antique Bakery and D.Gray-Man) and Yamatoworks/D.A.C (this was their debut production), and directed by Shuhei Morita (who also directed the Freedom OVA series). 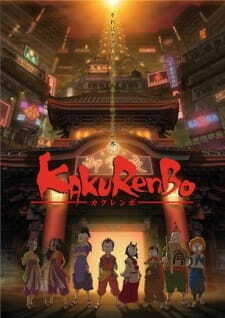 Kakurenbo was released on September 1st, 2004 in Japan, was licensed Stateside by the now defunct Central Park Media, who released it on October 30th, 2005. Story: In a city that's now in ruins, children play the game of Otokoyo (a Japanese version of hide and seek), but seemingly disappear whenever it's played, supposedly spirited away by demons. A boy named Haraku enters the game hoping to find his sister, who went missing playing Otokoyo. This OVA's really good at ramping up the creepy factor. You're thrown into this world with little to no background whatsoever, and truths unravel slowly as you watch these kids going through the game, which grows more and more scary as you go through. You don't know much about the kids initially, as they're all wearing fox demon masks, as required per the game, but you learn enough details about them as they go through the game. And there are some excellent and truly scary twists in this, though I would suggest some cultural background before going into this, as it'll make these make a lot more sense. And everything wraps up neatly in a half hour's time. Art: Kakurenbo was made entirely using 3D CGI and cel-shaded animation, like in Legend of Zelda: Wind Waker. The art for this in general is incredibly well done, and conveys the creepiness of the atmosphere perfectly, not to mention the designs of the creatures you find in here. 'm personally not that much of a fan of cel-shaded animation, though, as it does look a bit strange in places, especially with regards to the childrens' expressions, which are incredibly wooden. It is a fairly new technology, though, so it'll probably become better-used with time. Music: I really like what they did here. Traditional instruments are used and orchestrated perfectly, as is the incredibly understated use of silence, to add to the tension in the entire thing. Excellently done. Seiyuu: They didn't particularly stand out, but neither did they leave much of an impression on me. Overall, passable job here. Length: The OVA does feel a bit constrained by it's half-hour run time, but it still manages to tell a good, creepy story, even if we aren't as invested as we could be in the kids. Overall, it does well with what time it has, even if it could be a bit better. Overall: An amazingly creepy OVA with a pretty good story and music track, decent art and seiyuu, and a length that could've been longer for maximum effect. A good watch for Halloween. There are 2 reasons to write a review. 1. Is this anime for you? A: If you are easy to trick and get lost in atmosphere quite often, or don't watch horror much or are frightened easily then yes. Now part 2 is justify why you hate something to the people who love it. (Fair enough since you should at least provide good reasoning for liking or hating something.) Past this part has SPOILERS. It is a game of 7 children. There are 8 children. This is the start. Gee, WONDER WHO THE 8TH IS!? Also, she looks exactly like the one kids sister (despite wearing a mask), and they all wear fox masks. Now they spend 16 minutes running around the city looking for the girl (8th child) as well as being chased by monsters. During which period, they find a poster with 4 monsters and a fox in the middle. Right then I stopped the movie, walked to my brother's room and explained to him That I'm watching a OVA in which there are kids running around with a fox mask, an extra kid pulling a Silent Hill 2, and that the fifth monster was a fox. We said IN UNISON "She's it". She literally is "It" btw. To catch the children. Then after 16 minutes elapse, we get to see that SHE IS THE MONSTER! Oh wow, shocker on shock street. They still feel the need to then explain that however. Then she says "When we play Hide And Seek the city gets brighter, but only for a minute". Right then I said "She's using them as batteries" then that's revealed, as if that's a surprise. Then it's revealed the last child is it, go figure. So in addition to being 100% predictable, how is the atmosphere since that's a key aspect of horror! It's not great. The music is poor, it's often annoyingly dark despite being animated, the creatures are not that scary, the characters are not particularly likable. They're UNLIKABLE CHILDREN, how is that possible!? Probably because they're soulless, in a 20 minute production, designed primarily to serve as fodder for the monsters. The only thing it does well is somehow make 3d cell shading not look horrible for 20 minutes. So I guessed the plot, I wasn't afraid or creeped out despite watching it at midnight in a dark room, and it didn't entertain me. Enjoy! I am being generous with my rating. Kakurenbo is a short flick involving an urban legend that tells of how those playing a specific game of hide-and-seek at a certain forbidden, deserted neighborhood all goes missing without a single trace. This being of the horror genre can mean only one thing: a group of kids got curious and were lured into the game, with obvious disastrous consequences, as they found out just why the game is a taboo. I'm not expecting much from the characters, since this is such a short film (and a horror one at that). You have the bully/ jerk jock archetype and his cronies, followed by the stoic and quiet characters, the obligatory mysterious creepy child and so on. The cast may not be outstanding, but they suit the show just fine, though it would be nice if the movie were somewhat longer so as to allow a little more characterization; a bit more background on the characters' motivations, maybe a little bit about the town and so on. While the idea of having the entire cast wearing the fox masks in order to play the game prevents the audience from seeing their expressions, it does add to the ambience and that's the crucial point. Indeed, because the story is such a simplistic and short one, the movie relies heavily on its audio and visual elements. As such, the animation quality is unsurprisingly impressive. Things such as the way shadows are cast, as well as how the various lighting effects are done all helped to create a spooky atmosphere for the story. Furthermore, the abandoned buildings in the background are detailed and appear to have a tint of cyberpunk feel to it, suitably adding to the mood. Last but not least, the music compliments the movie well. Using an orchestra of traditional Japanese instruments certainly helped in creating a haunting, chilling soundtrack throughout the movie. My only complaint however, goes to the demons themselves. They are too obvious. A large element of horror and paranoia stems from not knowing what you’re up against; yes, the demons need to be scary looking as well (and they do look menacing) but it is building up the suspense of them appearing that really sets the tension. In this case, the demons are properly seen right from the beginning. We see them too clearly and that results in the show being less spooky than it could have been. I guess this is attributed the fact that film is simply too short to do proper build-ups. On the other hand, the designs for the demons are interesting: traditional Japanese folklore sort of demons but part mechanical – further contributing to the subtle cyberpunk feel. All in all, Kakurenbo is a reasonably decent show to watch. While not downright spine-chilling scary, it is nonetheless relatively creepy, particularly with the reveal and the stinger at the end. It being such a short film thus bears resemblance to those series of short horror stories prevalent on the net (also known as 'creepy pastas'). If anything else, Kakurenbo is at least worth the visual treats it offer. If you're a fan of anime or Japanese culture, you've probably seen a kitsune mask before. Where does it come from? What is it used for? Let's take a brief look at the cultural significance of the kitsune mask and some of its appearances in anime.